Mrs. Allred is a lifelong resident of the Birmingham area. She graduated from the University of Montevallo with a Bachelors of Science in Elementary Education and a Masters in Education Leadership. 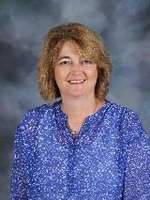 Mrs. Allred also earned a Education Specialist degree in Education Leadership from the University of Alabama at Birmingham. After teaching 5th grade at Moody Middle School she was promoted to Assistant Principal where she served for two years and then named Principal where she happily serves today.